Ever get that ominous feeling on your way to work/the gym/rowing practice/a run, that something is not quite right? Well today was my day that I REALLY wish would have begun again. OK, so alarm went off. Tick – fine. Showered to wake myself up – tick, clean. Bob Geldof was right. Mondays are not my best of days. There is just something about Mondays. Totally psychological. You’re probably nodding in agreement with these comments. And I have no excuse. I don’t work a typical 9-5, so what is my problem? First, my coffee didn’t taste like coffee. It was just hot, wet liquid. As I drove to the Shed, the storm clouds above looked ominous that it would be a wet session on the water. I got every red light. Then I heard on the radio that Lou Reed had passed this earth. 71. Really? School and Uni memories came flooding in, and that was quite difficult at 4.45am. Third or is that sixth? Two dead ringtail possums on the road. I really get sad when I see possum carnage. And they were big guys too. I wonder how old they were in possum years? 71 too? Rowing session. Well I’m not sure what was going on, but I was hearing words, but not hearing them properly. Seeing things, but were they in slow motion? Calls were rubbish. This is probably where I should stop this blogpost…. 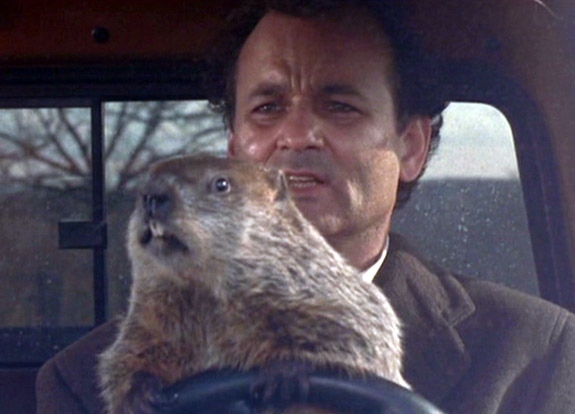 But no, I know you want to read my Groundhog moment. Or is there several? That’s when I wake up from my nightmare and the rudder is safely in my bag. And has NOT, no has not fallen into the Brisbane River. Sigh. I really need to get my coxswain mojo back. Or we can just start the day again. Without all of the bad things this time around. OK?